It’s easy enough to make a passable rockabilly record. Every city has a few guys and gals who slap doghouse fiddles and set fire to Gretsch fretboards, and let’s face it, penning neo-go-cat-go rave-ups is more pompadour sculpting than it is brain surgery. One way to stand out is to prop a pretty girl behind the vintage chrome microphone, but to go from Joanie B. Goode to Joanie B. 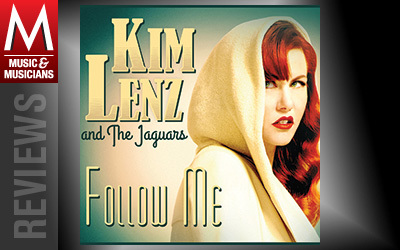 Great, even the foxiest rockabilly vixen needs heart and soul and humor. That’s why Kim Lenz is a genre superstar. Arriving on the heels of some personal setbacks—Lenz recently discovered she was adopted and lost bandmate Nick Curran to cancer—Follow Me is sad, silly, saucy and soulful. The disc is fat with fasties, but Lenz hints at her pain on tracks like “Deejay,” a noirish ballad whose twilight-twang guitar and barroom piano are just campy enough to keep things light. On “Ghost of You,” she makes like a burlesque stripper as she dresses down an ex. During the piano solo, you can picture her removing opera gloves one finger at a time, easing real sorrow by putting on a real-gone show.